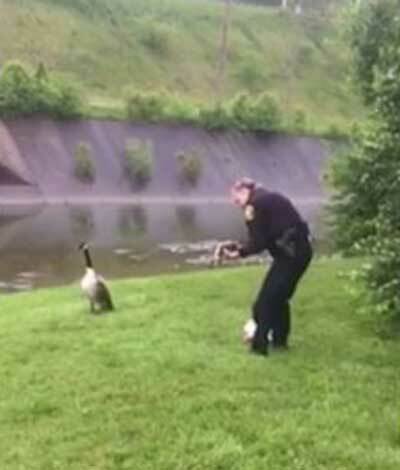 Sergeant James Givens is not used to seeing a goose pecking at his cruiser door, but that's what happened on Monday - and initially the veteran Cincinnati officer thought the goose was simply hungry. "It kept pecking and pecking and normally they don't come near us. "Then it walked away and then it stopped and looked back so I followed it and it led me right over to the baby that was tangled up in all that string," Givens said. The string was tied to a Mother's Day balloon among some of the litter near Mill Creek. Givens shot video on his cellphone. He and Specialist Cecilia Charron called the SPCA, but no one was immediately available to come out. So Charron took matters into her own hands. "Well she has a couple of kids of her own and I guess that motherly instinct must've kicked in because it was like they communicated. The mother goose didn't bother her," Given said. "So Specialist Charron came and untangled it. It took her a while because it was all wrapped up. I always thought that they were afraid of people and people say they will attack you if you get close to their young'uns and I was just surprised." Givens said it's something you don't see every day. That's the nicest thing I've seen all week. Thank you.